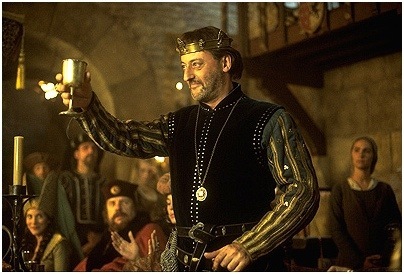 In the middle ages, a wealthy nobleman, Count Thibault (Jean Reno), is poised to marry the princess Rosalind (Christina Applegate) and live his days happily, but witchcraft forces him to kill Rosalind before their nuptials. In an effort to undo the sorcery and revive his beloved, Thibault and his peasant servant, Andre (Christian Clavier), enlist the help of an aged Wizard (Malcolm McDowell). But the Wizard’s spell goes horribly wrong, and Thibault and Andre find themselves transported to the twenty-first century. What, precisely, is wrong with this film? The better question: what isn’t wrong with it? Let’s get more specific. Time travel is a tricky subject in fiction; it needs to make enough internal sense as to not bog down the project with confused questions. Equally problematically, it needs be simplex enough as to avoid inevitable contradictions once it is defined too much. By keeping time traveling mostly unexplained, Just Visiting manages one-half of this tricky formula, but it stumbles on the other half. As just one example, Thibault has a modern day descendent, despite the fact that he murdered his fiancée and was thereby sentenced to death, all before he conceived a child. How is such a thing possible? How did the man produce children? Just Visiting never bothers to explain. Of course, time travel is a minor issue in comparison to the film’s failed attempts at humor. The best comedians understand that jokes generate laughter once, maybe twice, before growing stale, but such simple concepts escape writer/director Jean-Marie Poire and co-writers John Hughes and Christian Clavier. 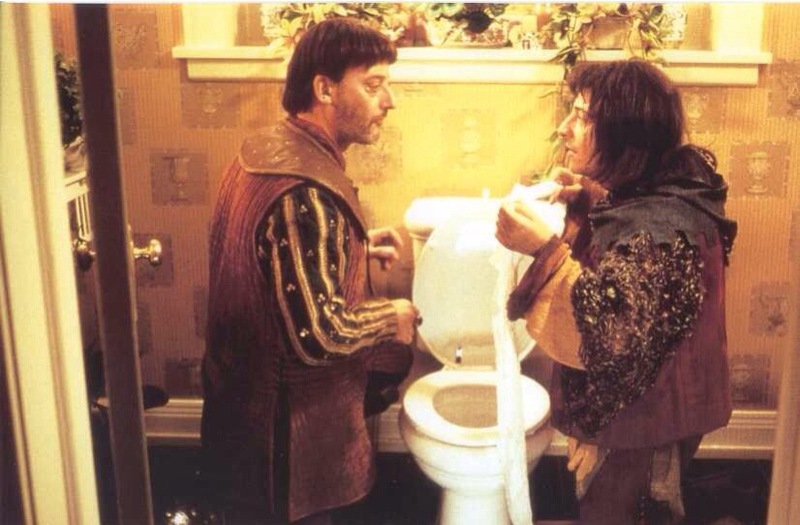 Thibault’s mistreatment of Andre is repeatedly played for laughs, which might have been fine, if the Count had occasionally varied his style of abuse, or even his insults. Ditto that for Thibault’s and Andre’s misunderstanding of modern conveniences (toilets, bathtubs, cars, etc). Because the jokes are never more than recycled versions of themselves, Just Visiting’s humor quickly grows tiresome, making this comedy decidedly not funny. Given that this film’s humor fails, its attempts at drama better save it. They don’t. Partially because all of the characters, most especially Amber (pictured above), are archetypes with little to no depth. We do not care about these individuals, because they do not have personalities. Instead, they have one or two traits each. For that reason alone, when Julia and Andre stand up for themselves and eventually receive their rewards, we are not moved, a fact that mightn’t be problematic if Just Visiting were actually funny (see above). John Hughes’screenplay, in other words, is bad. In fact, between terribly developed characters, repetitive humor and senseless plot devices, it is an utter disaster. So are most of the performances. Jean Reno never strikes the proper balance between slapstick comedian and straight man, and Christian Clavier’s comic turn is too over the top. Bridgette Wilson fails to do anything memorable with the terrible character she’s given, and Matthew Ross is wooden as the movie’s primary antagonist. Only Christina Applegate and Malcolm McDowell rise above the material. When playing Julia, Applegate is good enough to almost make us forget that her character is no better developed than anyone else’s. McDowell, too, makes the most of limited screen time, if only because he is suitably exaggerated. John Hughes does not redeem himself with Just Visiting. Like most people involved in making this movie, he ought to have been ashamed. This movie is so early 2000’s, and I enjoyed it back then….I was a preteen though, so ya I’ll take your word for it and skip it if I come across it again. That is my advice. I think it truly wretched. it’s sad to see Leon cavorting about in such a terrible film. I actually forgot that this one was part of the Hughes canon. I never knew it was a Hughes’ screenplay until Mutant’s blogathon. Supposedly the original French flick, Les Visiteurs, is actually good. It’s the same director, stars and two of the same writers. I haven’t seen it, so can’t say how it compares, but I wonder if Reno does comedy better in his native tongue. I must confess that I really like the original, it is very silly but genuinely funny. However I completely agree with you that this remake is an absolute detritus of a film in every way. I haven’t seen the original, but many people seem to like it (including the majority of Rotten Tomatoes critics). Maybe I’ll check it out at some point. I honestly cannot remember if I watched this or not. The concept looks like it could have been hilarious and Jean Reno isn’t a bad actor so shame that it came out sucking. This is a remake of a French flick called Les Visiteurs, also starring Reno and Clavier. The original is supposed to be really good, but I haven’t seen it. I’m not certain how involved Hughes really was. This is a remake of a French comedy, Les Visiteurs. The original had the same director, stars and other writers. Hughes might have mostly been a consultant, but he is a credited writer. F -!!! You should copywrite it. Even before reading your opinion, the premise did sound beyond saveable. What on earth were they all doing in this? The oddest part is that this is the second time this film got made. 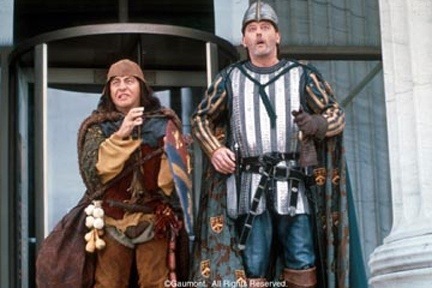 This is an English language remake of a 1990 something French comedy called Les Visiteurs, which had the same leads, director and two of same writers (Hughes wasn’t involved). And, oh by the way, Les Visiteurs is actually well reviewed (almost 80% positive on Rotten Tomatoes, I think). Obviously, I haven’t seen the original. And after seeing this remake I don’t know that I want to.